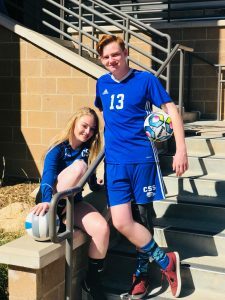 Seniors, Jamie and Molly Bigbee, joined CSS midway through the second grade when their parents, Lee and Tony, made a career move to Colorado Springs from Virginia. The vibrant, red-headed twins quickly adapted to their new life at the foot of Pikes Peak, each discovering their uniqueness while sharing similar passions. 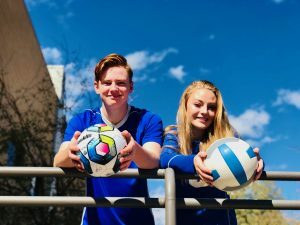 Balancing their love and appreciation of academics, athletics, and arts has been most impressive as they near the end of their time as Kodiaks. What has been your favorite aspect of your CSS experience? Jamie: I really like the low teacher-student ratio because it allows the students to be more focused and have an increase in understanding the materials since we can ask the teacher any questions we have. ECSs are my favorite aspect of the upper school because we get to dedicate a full month to something out of the educational norm, and we often get to travel abroad. I also like how everyone knows each other in the high school. I have good friends in every grade, a unique feature that is part of a small school culture. Molly: ECSs, the social community, and my relationships I have with my teachers are definitely the best parts of CSS. I have embarked on journeys and experienced things that I would never have been able to. I’ve taken trips around the globe, and because of CSS, these trips have been educational — I’ve actually learned about myself and the world. The social life at CSS is such a comfort during good days and rough patches. I take my close relationships for granted sometimes, but what a privilege it is to have a second family with whom I can take refuge and struggle through the same AP classes or college application processes. Some of my favorite people go to CSS, and I’ve known them since before I can remember. Lastly, the teachers at CSS are phenomenal. I don’t always appreciate the hours of homework assigned every night, but I am forever grateful for the preparedness that comes with that. I see that the rigorous academic load of CSS has its benefits in so many parts of my life. The teachers at CSS are committed to shaping us into hard-working, intelligent, and reliable students who can graduate knowing we are ready for some of the struggles found beyond high school. As young athletes what were your favorite sports? Jamie: I’ve grown up playing soccer, starting on a team in Virginia called the “Pumpkins” when I was four. 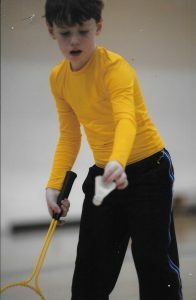 When we moved to Colorado, I started participating in Judo at the Olympic Training Center and went to a few competitions. Molly: When I was little, I was a ballerina and a tap dancer (maybe not a great one, but one nonetheless). I have been a soccer player since I was 8, playing club soccer since I lived in Virginia and school soccer since 5th grade. I was also very committed to CSS basketball for many years. But starting in 8th grade, volleyball became my favorite sport. 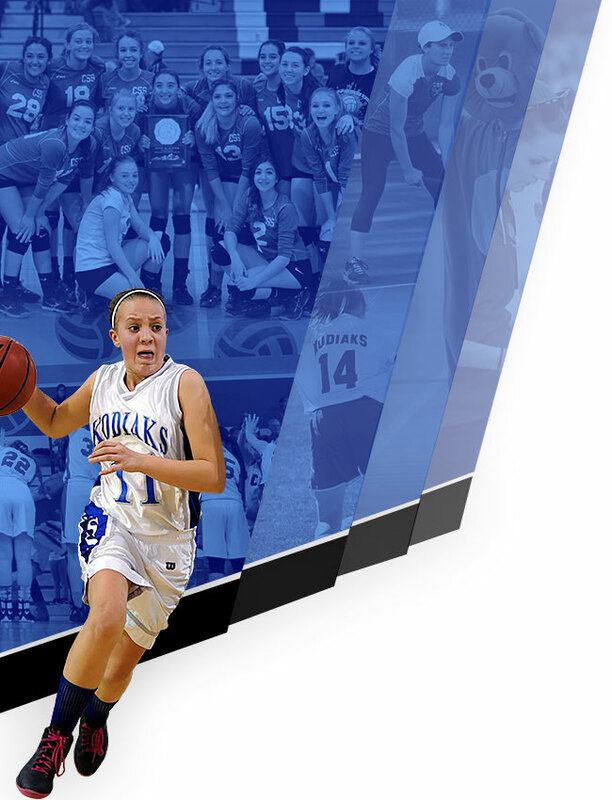 Can you describe your most memorable moment in Kodiaks athletics? Molly: My heart was pounding so hard that I could feel the blood pumping throughout my body. My head and jersey were drenched with sweat, and my knees, hips, and elbows were beaten up from constantly diving on the sport court. It was the first weekend of November in 2016 — the State Volleyball Championships in the Denver Coliseum where everything felt dream-like. Merely a year before I had been a timid freshman who was accepted onto the varsity team on a whim. Now I was the confident sophomore libero who proudly wore the CSS Kodiak jersey (a different color than everyone else’s, of course). 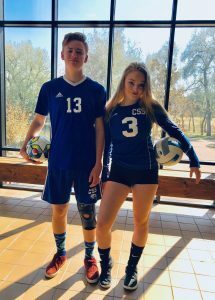 As we entered the Coliseum, I already felt as if my team had won: we were a cohesive unit of talented volleyball players from a small school who were making a run at State. It was intoxicating and uplifting to be a starting player at the State playoffs as an underclassman. Jamie: It was our Homecoming soccer game against ECA my junior year when Lewis D. scored a goal in double-overtime golden goal (sudden death) to secure the win. I had helped to set up the goal from my defensive position, and it turned out to be our greatest win of the season. The excitement and adrenaline that was pumping through our bodies made a few of us cry from pure joy, a memory I’ll never forget. 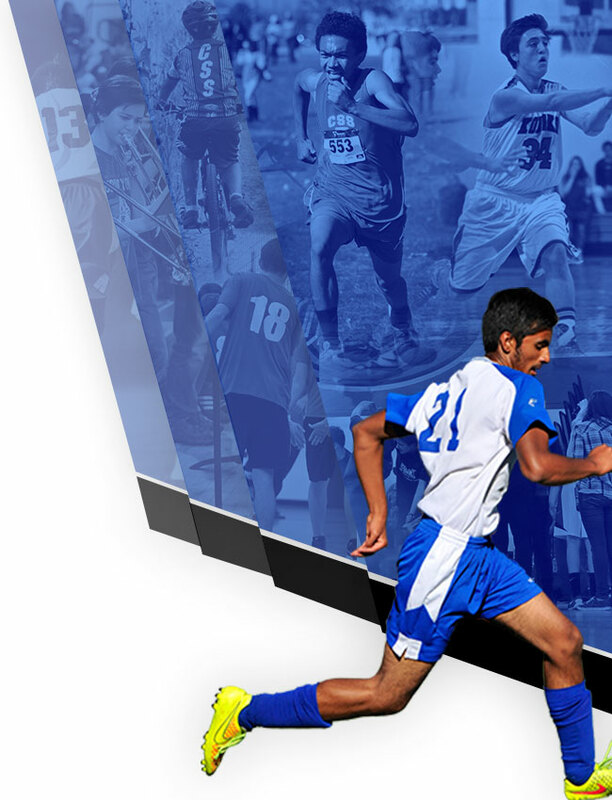 What legacy would you like to leave at CSS, both as an athlete and a member of the community? Jamie: I want people to remember me for my generosity and presence all around the school. I don’t think it’s too impressive to be good at one sport, but I think people should witness you participating in multiple sports, and even other programs at CSS, like in the arts. Molly: I would like to encourage anyone to try things that they’ve always wanted to, even if they think they’ll be bad at it, or to try something completely new. That’s what makes CSS so special. There is no chance of being turned down, and with that comes so many rare opportunities that no one should pass on. I tried volleyball in 8th grade thinking I’d be terrible, but here I am a senior, who last year held the #3 rank for digging and #6 rank for acing in the entire state. What other interests have you explored while at CSS and how have they made an impact? 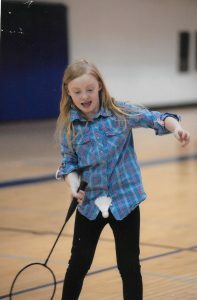 Molly: The CSS music program starts in 5th grade where everyone plays an instrument in band. I chose to learn the clarinet because my grandfather played it when he was in high school. I took private lessons in 5th grade, and then I joined the Colorado Springs Youth Symphony in 7th grade. The Youth Symphony has taken me all around the globe, including the Caribbean for an educational performance tour, and Australia and New Zealand this last summer, featuring a performance in the Sydney Opera House where I played clarinet solos. I am forever grateful to Mr. Moorehead for his guidance and mentorship with my music career. Jamie: Freshman year, I joined a club called KICS and it really shaped my high-school path and what I was doing after school on most days. I enjoyed working in the concessions stand, and I was impressed with the contributions that KICS was making to the community at large, like donating money to non-profits in the Give! Campaign and providing community service opportunities. Now as the president of the club, I feel like I have taken on even more responsibility with our new club sponsor Mr. Gaudet, and I like the direction that the club is taking in regards to entrepreneurship and non-profit grants. In what interests outside of CSS have you been invested? Molly: The Colorado Springs Youth Symphony has been a tremendous part of my life since 7th grade. The organization not only enforces musicianship, but it also shapes character. The founder and my current conductor, Gary Nicholson, teaches us to appreciate music, but more importantly he helps us to become better people. His goal for the organization is to change the global perception of the American teens. This is one of the reasons we take international tours, like the one we took to Australia and New Zealand this past summer. We have so many great opportunities in this organization, like being able to play with adult orchestras and performing in the Sydney Opera House. Without CSYSA, I would not have the confidence, musical skill, or perspective that I do today. Jamie: I auditioned for the Colorado Springs Youth Symphony in 8th grade, and it has been a constant endeavor in my life since then. I’ve played tuba and percussion under the direction of multiple conductors that have toured with us in the Caribbean, New Zealand, and Australia. This organization means so much to me because I get to meet many new people and be musically challenged even more than I currently am in the CSS band. What are your plans for next year? Will you each pave your own path or choose to stay together in college? Jamie: I’m applying to different engineering schools and am okay with if we don’t go to the same school. Although having a twin in some of the same classes can be useful, I’m really looking forward to actually being alone and making some new friends while pursuing more interests. I will miss Molly, but I think being apart will have a greater impact with our transitions as adults. Molly: We each have different careers in mind, but we are applying to some of the same schools. If we end up together, my parents might be relieved on some level to know that we have each other in what we will experience as a brand new world. If not, we can each learn how to really function independently and thrive on our own. How have your parents supported your CSS career? Molly: Our parents are so incredibly supportive. Of course, we have our ups and downs, but they are pillars in our lives through thick and thin. They always show up to every sporting event, performance, teacher conference, or any school event we have. Our parents like to help and teach us to directly solve problems rather than sugar coat it. They are both very intelligent and well-lived people. I’m so happy I have parents that don’t value all of the superficial things that our society falsely emphasizes, like appearance or social status. They value the long-term, beneficial things that encourage us to be the people who will change the world. Jamie: My parents have supported me throughout my whole CSS career. 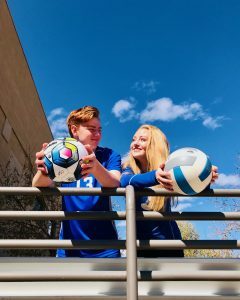 From joining the volleyball team last spring or to starting an e-sports team this fall, they’ve shown support through encouragement and positivity. What advice would you give to any incoming CSS student and why? Jamie: Try everything and find something that you actually enjoy. Don’t take school for granted and try to enjoy your overall educational experience at CSS. Molly: If you are a new or prospective CSS student, challenge yourself and take difficult classes. Do the extra work even if no credit is awarded because in the long run, you will come out on top. Next, try new things. The size and familiarity of CSS encourages you to expand your horizons. If you’ve always wanted to sing and act, try out for the school plays and musicals. There will be an opportunity for you to do something that you haven’t always had the courage to do. Finally, enjoy CSS because it offers so many cool experiences that we all take for granted, like ECSs and experiential learning in general. (I got to learn about eclipses by traveling to Wyoming to see the latest one in totality.) You will leave CSS with a greater perspective and knowledge about the world. What makes you most proud about being a Kodiak? Molly: I’m proud of being a Kodiak because despite the size of our school, our players, coaches, and fans take our athletics very seriously. Almost every sport has competed in regional and statewide championships. I love the commitment that evolves from CSS athletics. Jamie: I’m proud of being a Kodiak because of the values CSS emphasizes during game play. Some schools don’t stress teamwork, leadership, or even good sportsmanship, and I know that they are really good values to use and apply now and later in life. I really like this quote because it says that trying to be like other people isn’t unique at all. You want to discover who you are and then express it in ways that only you can, independent of others. Jamie: Percy Jackson and the Lightning Thief: I really like this book because at a young age, I was intrigued with Greek mythology. This book brought the world of a teenager and mythology together, and it was a dream come true. I’ve read the book at least 20 times just because of the amazing details it offers. What is your favorite performance that you’ve been a part of and why? Molly: The first is the collaboration of the Colorado Springs Youth Symphony and the Colorado Ballet Society in “A Colorado Nutcracker” performed last December. You’d think that hour after hour of playing the same, recognizable tunes from “Waltz of the Flowers” or “Dance of the Sugar Plum Fairies” would become a little redundant if not tiresome. It wasn’t. By far, this was one of my favorite concerts. Some musical works are based on stories, not excluding this one. “The Nutcracker” manifested on a stage full of sparkling tutus, colorful lights, and muscular ballerinas — it was phenomenal. My other favorite performance would have to be performing in the Sydney Opera House this past summer. The Youth Symphony spent the entire season preparing for this trip and performance. Playing solos in every song felt like an accomplishment alone, but being able to perform in a world-renowned concert hall was beyond exhilarating. During the piece Danzon No. 2 by Arturo Marquez, I stood and performed the opening solo, or duet with the piano, and I have never felt such a rush. Jamie: My favorite performance has to be in the Sydney Opera House over the summer leading into my senior year. The venue was packed and we were also nervous because our month-long tour had been building up for this one performance. We played a song called Danzon No. 2, and I really enjoyed playing it because my sister had clarinet solos. Also, I was the only source of rhythm for the whole orchestra, beating my claves to the “seductive” Cuban beat. What is your favorite thing about your twin sibling? Molly: Although I find it annoying sometimes, I love that Jamie comes to me with his problems. Of course, as his sister, I’m expected to be the one who talks through his problems with him, but it’s nice to know that he finds refuge in my advice. Jamie: Although most people think I don’t have one, I really like Molly’s ability to socialize with people and be able to easily make new friends. This will be a very good skill for her in the future as well. What do you two have in common and what sets you apart? Molly: Many people at first don’t think we’re related; some have even presumed we were dating. I can see why because we are two totally different individuals with different passions and different motivations. We share some common beliefs, like immigrants should be able to find refuge in the United States. Similarly, we do have fundamental similarities like extroversion and a need for friendships and social time. Jamie: Although we are similar, we are very different as well. I find myself more social, and I have a stronger will to go out of the way for someone I’m close with. We also have different career paths and classes that we’re taking. I’m taking three APs, Calculus, Statistics, and Physics, setting me up for a strong engineering career in the future. Molly is taking 4 APs, Psychology, Biology, Statistics, and Calculus, setting her up for a worthy career in the medical field. Whatever future path lies ahead, Molly and Jamie have a collection of tools for success. No doubt that they have maximized their CSS opportunities these past 10 years, whether on the same stage or in different arenas, and they are prepared to leave their mark in the world, making it a better place x 2.